Through the passes of the Pyrenees into Spain he passed along. He considered it to be advisable and his only chance. Napoleon’s army marched over the Guadiana Hills with their hearts full of woe. Leaving the command of his army to Generals Soult and Ney. They were driven from the village of Elnina at the bayonet’s point. The British at the charge of the bayonet soon made them retire. Whilst the dead and the dying lay weltering in their gore. And as they thought of him tears down their cheeks trickling fell. For the noble hero who had commanded them for many years. By giving them an inch or two of cold steel. Copy of a letter from the Hon. Michael De Courcy, rear-Admiral of the White, to the Hon. William Wellesley Pole, dated on board His Majesty’s ship the Tonnant at Corunna, the 17th and 18th inst. Having it in design to detach the Cossack to England as soon as her boats shall cease to he essential to the embarkation of troops I seize a moment to acquaint you, for the information of the Lords Comissioners of the Admiralty, that the ships of war, as per margin*, and transports, under the orders of Rear-Admiral Sir Samuel Hood and Commissioner Bowen, arrived at this anchorage from Vigo on the 14th and 15th instant. The Alfred and Hindostan, with some transports, were left at Vigo to receive a brigade of 3500 men, that had taken that route, under the Generals Allen and Craufurd. In the vicinity of Corunna, the enemy have pressed upon the British in great force. The embarkation of the sick, the cavalry, and the stores, went on. The night of the 16th was appointed for the general embarkation of the infantry; and mean time, the enemy prepared for attack. At three, P. M. an action commenced; the enemy, which had been posted on a lofty hill, endeavouring, to force the British, on another hill of inferior height; and nearer the town. The enemy, were driven back with great slaughter; but very sorry am I to add, that the British, though triumphant, have suffered severe losses. I am unable to communicate further particulars, than that Sir John Moore received a mortal wound, of which he died at night; that Sir David Baird lost an arm; that several Officers and many men have been killed and wounded; and that the ships of war have received all such of the latter as they could accommodate, the remainder being sent to transports. The weather is now tempestuous, and the difficulties of embarkation are great. All except the rear-guard are embarked, consisting, perhaps, at this moment, of 2,600 men. The enemy, having brought cannon to a hill overhanging the beach, have forced a majority of the transports to cut or slip. Embarkation being no longer practicable at the town, the boats have been ordered to Sandy Beach near the Light-House; and it is hoped that the greater part, if not all, will still be embarked, the ships of war having dropped out to facilitate embarkation. The embarkation of the troops having occupied the greater part of last night, it his not been in my power to detach the Cossack before this day; and it is with satisfaction I am able to add, that in consequence of the good order maintained by the troops, and the unwearied exertions of Commissioner Bowen, the_Captains, and other Officers of the Navy, the Agents, as well as the boats crews, many of whom were for two days without food and without repose, the army have been embarked to the last man, and the ships are now in the offing, preparatory to steering for England. The great body of the transports having lost their anchors ran to sea without the troops they were ordered to receive, in consequence of which there are some thousands on board the ships of war. Several transports, through mismanagement, ran on shore. The seamen appeared to have abandoned them, two being brought out by the boats’ crews of the men of war, two were burnt, and five were bilged. I cannot conclude this hasty statement without expressing my great obligation to Rear-Admiral Sir Samuel Hood, whose eye was every where, and whose exertions were unremitted. I have the honour to be be, &c.
Hazy weather rendering the Cossack obscure, I. detach the Gleaner with this dispatch. * Ville de Paris, Victory, Barfleur, Zealous, Elizabeth, Norge, Plantagenet, Resolution, Audacious, Endymion, Mediator. O’er the grave where our hero we buried. It is hardly surprising that the same subject inspired McGonagall to pick up his pen. General Sir John Moore marched into Spain in October 1808 at the head of 20,000 men to help thwart Napoleon’s intention to place his brother Joseph on the Spanish throne. Before long, however, he found himself faced by the Emperor himself with 300,000 troops at his command. He had no choice but to fall back in the face of such superior numbers. The retreat that followed was one of the most harrowing in British military history. Thousands of stragglers were lost in the bitter cold and high mountain passes as much of the army collapsed into a disorganised rabble. Fighting a series of brilliant rearguard actions, Moore managed to keep ahead of his pursuers and reach the port of La Coruña. Here he would turn and fight the French to win time to embark on the waiting transports. By now, Napoleon had returned to the comforts of Paris and had entrusted the pursuit to an army commanded by Marshal Soult. Soult’s army was not much more numerous than Moore’s, but it was much superior in cavalry and artillery as most of Moore’s had either already embarked or been lost in the retreat. On 16th January 1809, Moore chose a strong defensive position in rough country to the south of the town, Soult would attempt to drive him into the sea. The key to the British position was the village of Elvina. If this place could be taken, the British could be cut off from La Coruña and totally destroyed. Consequently it was here that the bitterest fighting took place, with a prominent part being played by the 4th Regiment, the 50th Regiment, and the 42nd Highlanders. The French attacks were beaten back with great loss, but at the moment of triumph Moore was hit by a cannonball and suffered a terrible wound to his left side. He was carried to the rear by his grieving highlanders, where he died a few hours later constantly asking for news of the battle. He needn’t have worried, for the British had held their line for the loss of about 900 lives, the French had lost nearer 2000. That night, Moore was quietly buried, in the manner so lyrically described by Wolfe, and the army was able to board the transports unhampered by their pursuers. Soult would later erect a fine monument in memory of his fallen adversary. Corunna had been a victory that would, in 1940, be echoed by Dunkirk: the bedraggled army had escaped destruction and survived to fight another day. Can you plase give me the names of the Staff Officers and who was there when Sir John was layed to rest? According to Christopher Hibbert’s book on Corunna, the funeral was attended by Colonel Paul Anderson, Major John Colborne, Captain(?) James Stanhope and Captain Hon. Henry Percy. Hibbert’s book is a very detailed and readable account – I’ve added it to the “Books” section above. I was wondering if you had a reference for the quote at the end by the Duke of Wellington on Sir John Moore: “You know, FitzRoy, we’d not have won, I think, without him.”? It’s good to read another example of our poet’s uncanny ability to depict a military disaster as another plucky success for the ever-victorious British. And surely that final couplet should qualify for an occasional appearance in ‘Quote of the day’? And that couplet wasn’t in the Quote of the Day list – but it is now! According to family lore an ancestor died at the battle of Corunna – Lieutenant Colonel Donald McDonald probably from Moidart area of Scotland. Is there any way to verify this? Appreciate any help. Can anyone tell me, and describe, the uniform that Sir John Moore was wearing at Coruna please? And does anyone know what standard he was bearing and describe it? 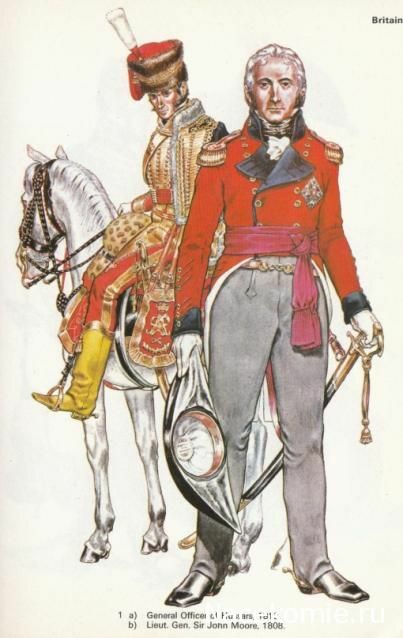 I’ve not found any specific description of Moore’s uniform at Corunna, but this plate from Philip Haythornthwaite’s Uniforms of the Peninsular War 1807-1814 gives an idea of his campaign uniform. I have discovered that, at Corunna, Moore was riding a cream-coloured horse with black mane and tail. Generals didn’t “bear standards” in the napoleonic wars, that’s a job for a sergeant!